(& some 4k TVs with satellite input) & how they compare on performance, price, features etc. & their use on decent motorised satellite systems (all satellite receivers are not the best at everything). When you see this symbol it means it's Enigma 2 Linux based. E2 (Enigma 2 Linux) satellites receivers have a massive following & support forums & a wealth of free 3rd party software support & are very powerful, basically combining an open source Linux computer with a satellite receiver & IP / CABLE & TERRESTRIAL TV access, originated by the DREAM MULTI-MEDIA company of Germany & then adopted across the industry & although sold legitimately, they are also used with certain software to access pay tv by sharing subscriptions- hence it's tongue in cheek name. But they are also known to bring with them the famous E2 learning curve of what can be months or more of learning, rather than days & some owners never get the full use, plus, we think, the base software originated by Dream Muilti-Media in Germany lacked a good intuitive design base & should have had a few more months programming for the intuitive interface software. 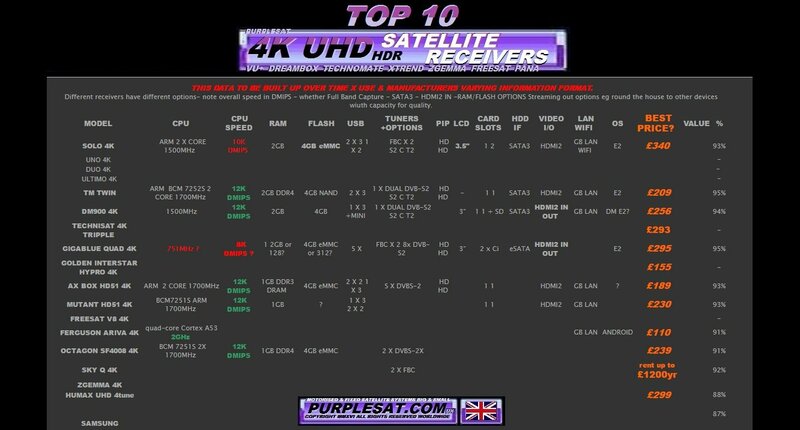 Even when you do get used to them they can still be awkward to use & some satellite basics are a chore, so these receivers do do almost* everything, but you may have to put a bit more work in to get more use from them & some satellite basics are missing or you have to use a PC - LAN linked to the box & using FTP etc. to do what are usually otherwise routine tasks such as satellite & channel editing forcing most to download ready made channel lists etc.